Fill highball glass with ice. Pour in Vodka and Liqueur. Fill with Orange Juice. Stir to mix drink, add wedge of orange. (4 / 5) – Yummy orangy goodness. This drink started a little strong, but as some of the ice melted, and the cocktail had time to take on some of the oils from the wedge it turned very orangy, and very yummy. 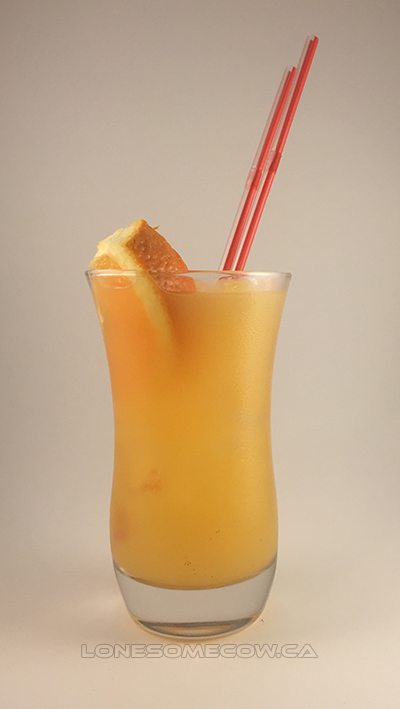 As a note, the recipe is 2 parts vodka, for 2 1/2 parts orange juice, depending on the size of your highball glass, you probably don’t need to be that specific. Mine was topped off almost to the brim with the listed ingredients. Fudging the orange juice a bit, probably not a big deal. In future I might pull back a 1/2 oz of vodka and add more vanilla to the mix. I couldn’t taste it at all, though maybe that was the point, and it’s job was to be subtle. From my perspective: This was really tasty but also very, very strong tasting. I could taste the vanilla, though it was extremely subtle. This was okay, but not one I would ask for.